A night out on the town doesn’t always have to mean hitting up a crowded club or busy bar. Sometimes, it can mean having a more fun evening over drinks at a lounge – which we think is pretty ideal for romantic date nights, post-work drinks, catching up with friends, and generally just letting loose and having fun! Here are some of Pune’s most popular lounges, which we think you should bookmark. Evviva Sky Lounge at the Crowne Plaza Pune City Centre (formerly the Courtyard by Marriott – Pune City Center) serves a full bar, an eclectic mix of cuisines, and great views of the city at night. From aperitifs and single-malts to classic cocktails, and even some of their own concoctions like the ‘Evviva Passion’ and the ‘mirchi martini’ – there’s plenty to choose from as far as drinks are concerned. Food is relegated to bar nibbles, grills, and assorted platters – and we suggest you try the latter, like the ‘Evviva mega sampler’ platters, to sample a bit of everything. Wind up with a classic Tiramisu for dessert, and end your night on a sweet note! Oak Lounge at the Marriott Suites is open much later than most – until 2.30 am – which is perfect for those who like to party hard. They even have a ‘Cognac & Cigar Lounge’ within the lounge itself, which is perfect for adults who prefer a taste of the finer things. On their drinks menu are pitchers, shooters, beer, alcopops, and everything in-between; and for nibbles, choose from their short selection of pizza or bar nibbles to satiate your drunchies. We recommend their Long Island Iced Teas (a cocktail not for the faint-hearted) and Kamakazi shots. Prices here are a bit steeper, so be sure to keep track of your bar tab! The House of Medici at the Westin in Koregaon Park is a high-end two-storey lounge. 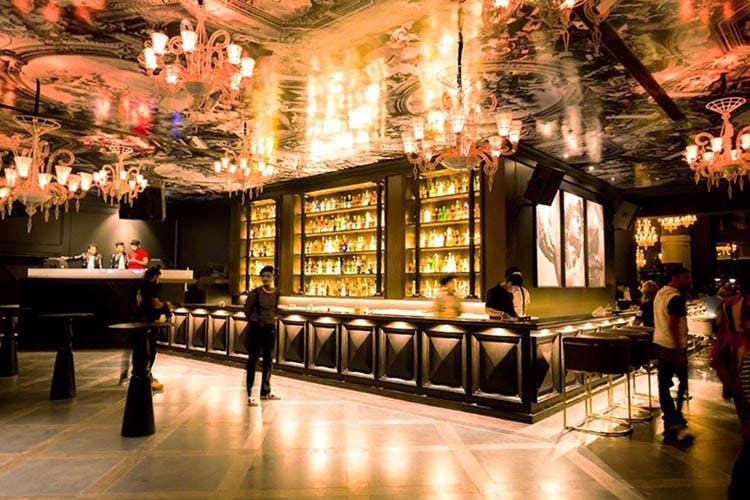 Boasting a ‘104-foot long horseshoe-shaped bar’ – it’s said to be the longest bar in India – they serve fancy smoked cocktails, unusual classics, and special infusions, among other liquors. Their much shorter, contemporary Continental/Asian food menu features appetizers, mini-meals, and desserts; in case you feel the need to nibble. We think you should try the smoked ‘Arrotino’ cocktail and the lemongrass prawns. Though the prices are higher here than at most other places, we think the overall luxe experience is worth your time and money. Hub at Xion Mall in Hinjewadi is a rooftop lounge with a slightly more ‘clubbing’ vibe. Open until 2.30 am on weekends (and 1.30 am on weekdays), this is a popular spot for grabbing post-work drinks and letting your hair down. There are three distinct sections you can choose to sit in. Though the cocktail and food menu is a bit basic, Hub has a lot to offer their patrons. Happy hours, match screenings, DJ and Bollywood nights are just some of the exciting events that happen here – which you can keep track of via their Facebook page. We recommend you try their ‘house cocktails’ like the HUB Barman’s Pitcher – served in a 1L jug, ideal for sharing with your buddies (or not). Atmosphere 6 at Lunkad Skymax in Viman Nagar offers two kinds of ambiences – an outdoor section open to the sky, with table-and-chair seating, and cosy basket-like cabanas; and an indoor section complete with a dance floor and mood lighting. The drinks menu ranges from mocktails and signature cocktails to classic concoctions, martinis, wine, shots, etc. ; and the food menu features the standard Indian-Oriental-Continental fare. We think you should try their signature Puneri mojito, and a classic ‘Moscow Mule’, and tandoori kebabs or pizza (or both) for more substantial eats. They run special prices on liquor, wine, and beer during their happy hours, which are from 12 pm to 10 pm on Mondays, Tuesdays, and Thursdays; and from 12 pm until 8 pm on Wednesdays and weekends (Friday to Sunday).